Terpenoids are a group of largest natural products with important biological functions, and their efficient biosynthesis is of particular importance to both academia and industry. As the building blocks for terpenoid biosynthesis, a suitable supply of isopentenyl diphosphate (IPP) and dimethylallyl diphosphate (DMAPP) is extremely crucial for efficient terpenoid biosynthesis. With this focus, we first introduce biosynthetic pathways of IPP and DMAPP, and then summarize the current strategies adopted for manipulating IPP and DMAPP supply. At last, how to further manage IPP and DMAPP supply to improve terpenoid biosynthesis is also proposed. Terpenoids are a class of natural products with diverse structures and essential biological functions (Schrader and Bohlmann 2015; Tarkowska and Strnad 2018). For example, animal-derived terpenoids (e.g., cholesterol, dolichol, ubiquinone) are involved in cell membranes formation, glycoproteins biosynthesis and intracellular electron transport (Goldstein and Brown 1990). Plant-derived terpenoids (e.g., tocopherol, brassinolide, and gibberellin) are responsible for the regulation of cell growth and defense (Piironen et al. 2000; Tholl 2015). In addition, many commercially useful compounds (e.g., pharmaceuticals, flavorings, biofuel) belong to terpenoid (Ajikumar et al. 2008; Immethun et al. 2013; Tippmann et al. 2013). Therefore, efficient biosynthesis of terpenoid is receiving great interests from researchers (Bian et al. 2017). According to the number of C5 units involved during their synthesis, terpenoids are classified as hemiterpenoid (C5), monoterpenoid (C10), diterpenoid (C20), triterpenoid (C30), tetraterpenoid (C40), and polyterpenoid (> C40) (Connolly and Hill 1991). Formation of terpenoid usually undergoes a continuous head-to-tail addition of its building blocks, which are isoprene diphosphate (IPP) and its isomer dimethylallyl diphosphate (DMAPP) (Karine et al. 2012; Laskovics and Poulter 1981). First, a head-to-tail condensation of IPP and DMAPP produces geranyl diphosphate (GPP), the precursor of monoterpenoid. Then, the successive addition of IPP results in the formation of precursors of sesquiterpenoid and diterpenoid, which are farnesyl diphosphate (FPP) and geranylgeranyl diphosphate (GGPP), respectively. On this basis, two molecules of FPP and GGPP are, respectively, head-to-head condensed to form squalene and phytoene, the precursors of triterpenoid and tetraterpenoid. These linearized precursors are further subjected to cyclization and post modifications (e.g., oxidation, acetylation) to form various terpenoids (Luthra et al. 1999; Mcgarvey and Croteau 1995). Although IPP and DMAPP are the crucial requisite to efficient terpenoid biosynthesis, their accumulation is harmful to cell growth and can affect terpenoid production in turn (George et al. 2018; Martin et al. 2003; Sivy et al. 2011). As a result, a suitable supply of IPP and DMAPP is of great importance to efficient terpenoid biosynthesis. Other than providing a comprehensive view of achieving efficient terpenoid biosynthesis based on one individual enzyme (Liao et al. 2014) or a particular biosynthetic pathway (Liao et al. 2016), we focus on summarizing the strategies of manipulating IPP and DMAPP supply in this review, including important and recent works which can reflect the latest progress. We also propose several strategies for further improving terpenoid biosynthesis regarding managing IPP and DMAPP supply. IPP and DMAPP are mainly synthesized via two pathways: the mevalonate (MVA) pathway (Liao et al. 2016) and the non-mevalonate pathway, which is also known as the 2-C-methyl-d-erythritol 4-phosphate (MEP) pathway (Rohmer 1999). The MVA pathway mainly exists in the cytoplasm and peroxisome of eukaryotes, while the MEP pathway exists in most bacteria (Boucher and Doolittle 2000; Lange et al. 2000). In addition, plants harbor the MVA pathway in the cytoplasm to form sesquiterpenoid and triterpenoid, and the MEP pathway in plastid to form monoterpenoid, diterpenoid and tetraterpenoid, respectively (Henry et al. 2015; Lichtenthaler 1999; Lichtenthaler et al. 1997). In the 1950s, the MVA pathway was recognized as the dominant pathway for terpenoid biosynthesis (Little and Bloch 1950). In this pathway, two molecules of acetyl-CoA are condensed to acetoacetyl CoA by acetyl-CoA acetyltransferase (AACT). Acetoacetyl CoA and another molecule of acetyl-CoA are then condensed by hydroxymethylglutaryl-CoA synthase (HMGS) to form 3-hydroxy-3-methylglutaryl-CoA (HMG-CoA), which is further reduced by 3-hydroxy-3-methylglutaryl-CoA reductase (HMGR) to produce mevalonate. After a two-step phosphorylation and decarboxylation catalyzed by mevalonate kinase (MK), phosphomevalonate kinase (PMK), and diphosphomevalonate decarboxylase (MVD), mevalonate is converted into IPP (Bochar et al. 1999), and then, IPP is isomerized to DMAPP by isopentenyl diphosphate isomerase (IDI) (Fig. 1) (Kaneda et al. 2001). Most archaea were characterized to harbor enzymes of the MVA pathway (Nishimura et al. 2013), and a modified MVA pathway may exist in some archaea lacking PMK and MVD (Vinokur et al. 2014). Initially, Grochowski et al. identified an isopentenyl phosphate kinase (IPK) from Methanocaldococcus jannaschii capable of phosphorylating isopentenyl phosphate (IP) to generate IPP (Grochowski et al. 2006). Later, the phosphomevalonate decarboxylase (MPD) activity has been identified in Chloroflexi bacterium Roseiflexus castenholzii (Dellas et al. 2013) and archaeal extremophile Haloferax volcanii (Vannice et al. 2014). Based on these discoveries, researchers proposed an alternative route to produce IPP (Henry et al. 2015): after formation of 5-phosphomevalonate (MVP), the MPD catalyzes the decarboxylation of MVP to IP, and IPK catalyze the phosphorylation of IP to IPP (Fig. 1). After the 1950s, a growing number of investigations indicated that IPP might not be synthesized merely from the MVA pathway. In one study, the 14C-labeled mevalonate was rarely incorporated into the isoprenoids (e.g., carotene) produced in the plastid of maize seedlings, while the cytoplasmic sterols were quickly incorporated (Goodwin 1958). Similar phenomena were also reported in carrot, tomato and oat (Braithwaite and Goodwin 1960a, b; Lichtenthaler et al. 1982). Moreover, the 14C-labeled pyruvate and CO2 were rapidly incorporated into plastid-produced isoprenoid in Sinapis alba (Lutke-Brinkhaus and Kleinig 1987). Using gas chromatography–mass spectrometry, a series of follow-up studies revealed a mevalonate-independent pathway, the MEP pathway, for IPP biosynthesis (Rodriguez-Concepcion and Boronat 2002; Rohmer 1999; Rohmer et al. 1993; Schwender et al. 1996). In MEP pathway, pyruvate and glyceraldehyde 3-phosphate (G3P) are condensed by thiamin diphosphate-dependent enzyme 1-deoxy-d-xylulose-5-phosphate synthase (DXS) to form 1-deoxy-d-xylulose 5-phosphate (DXP). DXP was reduced by 1-deoxy-d-xylulose-5-phosphate reductoisomerase (DXR) to form MEP (Kuzuyama et al. 1998), which is catalyzed by 2-C-methyl-d-erythritol 4-phosphate cytidylyltransferase (MCT) to generate 4-(cytidine 5′-diphospho)-2-C-methyl-d-erythritol (CD-ME). After phosphorylation, cyclization and ring opening, CD-ME is converted into 1-hydroxy-2-methyl-2-butenyl 4-diphosphate (HMBPP) under the catalysis of 4-diphosphocytidyl-2-C-methyl-d-erythritol kinase (CMK), 2-C-methyl-d-erythritol 2,4-cyclodiphosphate synthase (MDS) and 4-hydroxy-3-methylbut-2-enyl-diphosphate synthase (HDS), respectively (Herz et al. 2000) (Fig. 1). Different from the MVA pathway, in which the DMAPP is synthesized via IPP isomerization, the IPP and DMAPP derived from the MEP pathway are directly generated from HMBPP by 4-hydroxy-3-methylbut-2-enyl diphosphate reductase (HDR) (Felix et al. 2002). In 2012, an MEP shunt pathway (5-methylthioadenine (MTA)-isoprene pathway) was characterized to generate IPP and DMAPP in Rhodospirillum rubrum (Erb et al. 2012) (Fig. 1). First, MTA is catalyzed by MTA phosphorylase (MtnP) to form 5-methylthio-d-ribose-1-phosphate (MTR-1P), followed by an isomerization to generate 5-methylthio-d-ribulose-1-phosphate (MTRu-1P) by MTR-1P isomerase (MtnA). Then, MTRu-1P is converted into a mixture of 1-methylthio-ribulose-5-phosphate (MTRu-5P) and 1-methylthio-xylulose-5-phosphate (MTXu-5P) by MTRu-1P dehydratase, which is a ribulose-1,5-bisphosphate carboxylase/oxygenase (RubisCO)-like protein (RLP) (Imker et al. 2008). After that, MTXu-5P is converted into DXP by cupin-type MTXu-5P sulfating enzyme-mediated catalysis, which simultaneously produces mercaptan as a sulfur source for cell growth. The rlp and cupin gene are usually physically close in a cluster. The MEP shunt pathway has been demonstrated to play an important role in generating DXP in R. rubrum. In addition to R. rubrum, organisms carrying the rlp–cupin cluster were predicted to have the MEP shunt pathway, such as Rhodopseudomonas, Rhodomicrobium, and Nitrosococcus. As confirmed in a recent study, the MEP shunt pathway has been detected in Rhodopseudomonas palustris under aerobic cultivation (Miller et al. 2018). A sufficient supply of IPP and DMAPP is the basic premise for terpenoids biosynthesis (Formighieri and Melis 2014). However, an excessive level of IPP and DMAPP may cause impaired cell growth and accordingly limit terpenoid production (George et al. 2018; Sivy et al. 2011). Thus, manipulating the supply of IPP and DMAPP is of particular importance for terpenoid biosynthesis. To achieve it, strategies including rewiring the central metabolic pathway, overcoming the rate-limiting step, introducing heterologous pathway, enhancing interaction between different biosynthetic pathways, alleviation of the toxicity of IPP and DMAPP, as well as discovering or engineering downstream enzymes by exploration of the toxicity of IPP and DMAPP will be thoroughly discussed in this part. The initial substrates for IPP and DMAPP biosynthesis, including acetyl-CoA, G3P and pyruvate, are generated via the central metabolic pathway. Rewiring central carbon flux towards these substrates allows increased production of IPP, DMAPP and downstream terpenoids. To block the formation of acetic acid from acetyl-CoA and direct more carbon flux into IPP synthesis, the gene cluster ackA-pta was disrupted in Escherichia coli. As expected, the acetate production was greatly reduced in the resultant mutant and the lycopene production was 45% higher than the original strain (Vadali et al. 2005). As compared to the glycolytic pathway, the generation of acetyl-CoA from the pyruvate dehydrogenase bypass pathway is more efficient (Pronk et al. 1996). Overexpression of pyruvate dehydrogenase, acetaldehyde dehydrogenase, and acetyl-CoA synthetase encoding genes led to increased production of mevalonate, IPP, and amorphadiene (Shiba et al. 2007) (Fig. 2a). Supplying equal molar of G3P and pyruvate is required for DMAPP and IPP generation via the MEP pathway. At the end of glycolysis, conversion of G3P into phosphoenolpyruvate (PEP) is achieved by phosphoglycerate mutase (PGM) and enolase (ENO), followed by formation of pyruvate by pyruvate kinase (PK) (Romano and Conway 1996). Moreover, production of PEP can also be achieved by conversion of either oxaloacetate, an intermediate of TCA cycle, by PEP carboxykinase (PCK) (Clark 1989) or pyruvate by PEP synthase (PPS) (Geerse et al. 1989; Ramseier et al. 1993). On the other hand, the opposite reaction from PEP to pyruvate is catalyzed by the enzymes PykF and PykA (Boiteux et al. 1983; Waygood et al. 1976). As a result, overexpression of PCK and PPS led to the accumulation of PEP, while deletion of PykF and PykA further prevented the conversion of PEP into pyruvate. These metabolic engineering efforts maintained an equal balance between pyruvate and G3P, and successfully improved production of IPP and its downstream product lycopene in E. coli (Farmer and Liao 2001) (Fig. 2b). In a more recent work, five MEP feeding modules derived from four glycolytic pathways in E. coli, which are Embden–Meyerhof pathway (EMP), Entner–Doudoroff pathway (EDP), pentose phosphate pathway (PPP) and Dahms pathway, respectively, were tested for terpenoid production. With simultaneous generation of G3P and pyruvate, the EDP-containing module exhibited significantly higher isoprene titer and yield than that of the EMP-containing module, which provides a new direction to rewire the central metabolism for MEP-dependent terpenoid biosynthesis (Liu et al. 2013). Except for providing sufficient initial substrates, overcoming the rate-limiting steps of IPP and DMAPP biosynthesis is not new but an effective approach for increasing their production. In the late 1980s, HMGR was first identified as a rate-limiting enzyme in the MVA pathway (Bach 1986). In that study, the phytosterol contents decreased significantly when their producing hosts were treated with specific competitive inhibitors of HMGR (Bach 1986; Stermer and Bostock 1987), indicating that HMGR activity greatly affected terpenoid biosynthesis. After that, there is increasing evidence to show that HMGR plays a key role in increasing terpenoid yield in plants, yeast and bacteria (Bach 1986; Chappell et al. 1995; Enfissi et al. 2005; Kim et al. 2013; Ma et al. 2011; Stermer et al. 1994; Tsuruta et al. 2009). Overexpression of hamster HMGR in tobacco driven by the cauliflower mosaic virus 35S promoter resulted in an over 100-fold increase in cycloartenol (a sterol biosynthetic intermediate) and a 2-fold increase in total sterols (Chappell et al. 1995). Two isoenzymes of HMGR, Hmg1p and Hmg2p, were identified in yeast. Although degradation of these Hmg proteins was observed with increased level of intermediates in MVA pathway, Hmg1p was more stable than Hmg2p (Chun et al. 1990; Hampton and Rine 1994). Since numerous studies indicated that overexpression of Hmg1p enhanced the MVA pathway, it is still subjected to feedback inhibition under high level of sterol (Hampton and Rine 1994). To overcome this limitation, the N-terminal domain-truncated Hmg1p (t-HMGR) was constructed. As a result, overexpression of t-HMGR led to nearly five times higher production of amorphadiene in Saccharomyces cerevisiae (Ro et al. 2006). This strategy also increased sterol, sitosterol, stigmasterol and artemisinic acid-12-β-diglucoside production in tobacco, Lavandula latifolia, and Nicotiana benthamiana, respectively (Holmberg et al. 2003; Munoz-Bertomeu et al. 2007; van Herpen et al. 2010). On the other hand, increasing the terpenoid production was also achieved by protein engineering of Hmg2p. For example, a stable variant Hmg2p (K6R) was constructed to counteract cellular ubiquitination, and improved the production of monoterpenoid and sesquiterpenoid (Ignea et al. 2011). Besides, HMGS manipulation is also considered as an effective engineering strategy for MVA-derived terpenoid production (Liao et al. 2014). A HMGS mutant from Brassica juncea BjHMGS1 (S359A), with tenfold increased specific activity (Nagegowda et al. 2004), was overexpressed in Solanum lycopersium, which improved the production of MVA-derived squalene and phytosterols (Liao et al. 2018). In addition, IPK plays a significant role in the alternative MVA pathway, because it regulates the ratios of IP–IPP and 4-dimethylaminopyridine (DMAP)–DMAPP (Henry et al. 2015). The IPK homologs have been found in plant genomes (Dellas et al. 2013). Henry et al. confirmed that Arabidopsis thaliana IPK, phosphorylates IP and DMAP (Henry et al. 2015). The contents of campesterol, sitosterol and β-caryophyllene were reduced in ipk knockdown or knockout A. thaliana (Henry et al. 2015). This may be due to a decrease in the content of important precursors, IPP and DMAPP. Later, overexpression of Arabidopsis-derived IPK in tobacco led to increased production of cholesterol, stigmasterol, sitosterol and campesterol (Henry et al. 2015). In a more recent study, overexpression of MPD from Roseiflexus castenholzii in tobacco enabled producing IP from scratch, which introduced another branch of the MVA pathway to increase the metabolic flux towards downstream terpenoids. As a result, a 3.1- and a 6.4-fold increase of monoterpene and sesquiterpene was achieved in this plant, respectively (Henry et al. 2018). DXS is proved as the first rate-limiting step in MEP pathway (Estevez et al. 2001; Kim et al. 2006; Zhao et al. 2011), whose kcat/KM value is substantially lower than other enzymes in this pathway (Kuzuyama et al. 2000). Increasing DXS activity is recognized as the most effective strategy for terpenoid biosynthesis in many species, such as Synechococcus leopoliensis (Bach and Lichtenthaler 2010; Schwender et al. 1996), Lycopersicon esculentum (Rohmer 1999) and Streptomyces (Kuzuyama et al. 1998). For example, heterologous expression of DXS from Bacillus subtilis improved IPP, DMAPP and β-carotene production in E. coli (Leonard et al. 2010). To improve enzymatic activity of DXS, site-directed mutagenesis of the recombinant poplar DXS was conducted by alleviating the feedback inhibition from IPP and DMAPP (Banerjee et al. 2016). In addition to DXS, the IDI catalyzes a critical step by converting IPP into its isomer DMAPP, which is important for balancing the available precursors IPP and DMAPP to produce desired terpenoids (Hahn et al. 1999; Yoon et al. 2007). Heterologous overexpression of IDI from Haematococcus pluvialis enabled carotenoid accumulation in E. coli (Sun et al. 1998). Later, the idi gene isolated from Lycium chinense was characterized and overexpressed in E. coli. The β-carotene of the IDI-overexpressed strain was about twofold higher than of the control strain (Li et al. 2016). In addition to simple overexpression of rate-limiting enzymes, which may cause metabolic imbalance and suboptimal production of terpenoids, a combinatorial strategy, which included directed co-evolution of key enzymes DXS, DXR and IDI, and promoter modification, was developed to significantly improve isoprene production (Lv et al. 2016). The authors also attributed this success to the establishment of a lycopene-indicated high-throughput screening method. To overcome the limitation and circumvent the natural cryptic regulation of the MEP pathway, introducing the heterologous MVA pathway is a commonly adopted alternative to increase IPP and DMAPP in E. coli (Alonso-Gutierrez et al. 2013; Carter et al. 2003; Martin et al. 2003; Vadali et al. 2005; Yoon et al. 2009; Zurbriggen et al. 2012). For example, expression of MVA pathway from Saccharomyces cerevisiae in E. coli increased the production of IPP, DMAPP and the sesquiterpenoid amorphadiene (Martin et al. 2003). On this basis, replacing the HMGR from S. cerevisiae with a more soluble homolog from Staphylococcus aureus (Hedl et al. 2004) resulted in further increase of amorphadiene in E. coli (Newman et al. 2006). Similarly, the MVA pathway from Streptomyces sp was reconstituted in E. coli to produce 11.8-fold higher lycopene than that of original E. coli strain (Harada and Misawa 2012). In addition, MVA pathway genes from Streptococcus pneumoniae, Streptococcus pyogenes, S. aureus, Enterococcus faecalis and S. cerevisiae were co-expressed in E. coli to achieve a high yield of β-carotene (Yoon et al. 2009). Introduction of heterologous MVA pathway and optimization of the endogenous MEP pathway resulted in production of 122.4 mg/L β-carotene in the engineered E. coli strain, which was 113- and 1.7-fold higher than that of strain harboring the native MEP pathway alone and strain harboring the MVA pathway and native MEP pathway, respectively (Yang and Guo 2014). 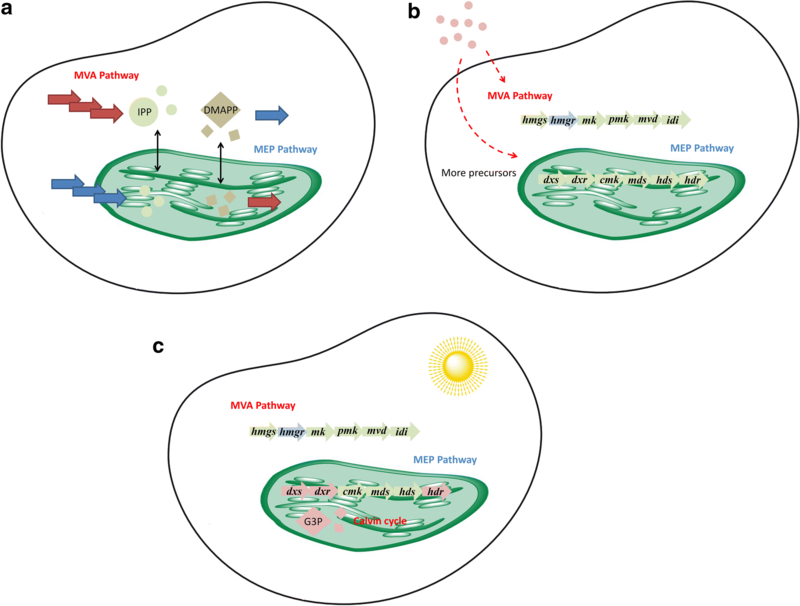 Further, simultaneous or independent overexpression of MEP and MVA pathway was performed in E. coli to investigate whether there exists a synergy between the two pathways. According to the 13C labeling result, the MEP pathway flux in strain with overexpression of the dual pathways was 4.8-fold higher than that of the strain with overexpression of MEP pathway alone, and the MVA pathway flux in the dual pathway overexpressing strain was 1.5-fold greater than that of the strain with overexpression of MVA pathway alone. Finally, the resultant strain harboring dual pathways produced 24 g/L isoprene in fed-batch fermentation (Yang et al. 2016). Compared to the MVA pathway, the MEP pathway is superior in stoichiometry and accumulates less byproduct (Dugar and Stephanopoulos 2011). Researchers tried to reconstitute MEP pathway of E. coli in S. cerevisiae, which only harbors the MVA pathway to produce terpenoid, but failed to get functional expression of 4-hydroxy-3-methylbut-2-enyl-diphosphate synthase (IspG) and 4-hydroxy-3-methylbut-2-enyl diphosphate reductase (IspH) (Carlsen et al. 2013; Partow et al. 2012). In the MEP pathway, IspG and IspH are iron–sulfur cluster proteins, which require functional assembly of the [4Fe–4S] iron–sulfur cluster (ISC) (Seemann and Rohmer 2007) and electron transfer by flavodoxin (Fld) and ferredoxin (flavodoxin) NADP+ reductase (FNR) (Grawert et al. 2004; Xiao et al. 2009; Zepeck et al. 2005). Co-expression of IspG from Bacillus thuringiensis, IspH from E. coli, Fld from Bacillus subtilis, FNR from Arabidopsis and ISC from E. coli successfully reconstituted MEP pathway in S. cerevisiae (Kirby et al. 2016). As mentioned above, plants naturally harbor the MVA and MEP pathway in cytoplasm and plastid, respectively. Single blocking the MVA or MEP pathway cannot completely block terpenoid biosynthesis in cytoplasm or plastid, indicating that the common precursor of these two pathways (e.g., IPP, GPP, FPP, and GGPP) can be freely transported into different subcellular regions (Aharoni et al. 2004; Asaph et al. 2003; Bick and Lange 2003; Bouvier et al. 2000; Hemmerlin et al. 2003; Kasahara et al. 2002; Laule et al. 2003; Gutensohn et al. 2013). Therefore, enhancing such interaction helps to promote terpenoid biosynthesis (Fig. 3a). In spiked lavender, IPP and DMAPP are mainly produced from the MEP pathway. However, terpenoids 1,8-eucalyptol and camphor increased in the HMGR overexpressed plants (Mendoza-Poudereux et al. 2015). Similarly, overexpression of HMGR in S. miltiorrhiza hairy roots can also enhance the production of diterpenoid tanshinones, which is believed to be produced from the MEP pathway (Kai et al. 2011; Shi et al. 2014). A possible explanation is that more IPP synthesized in the cell cytoplasm is transported into the plastid to serve as the precursor of the MEP pathway. In another study, overexpression of HDR in Artemisia annua L. increased the production of artemisinin and other sesquiterpenes. Green florescence protein fusion and confocal microscopy analysis indicated that HDR was localized in the chloroplast, and transport of IPP from chloroplast to cell cytoplasm was observed in the 13C labeling experiment, suggesting that more IPP was available for terpenoid production from the MVA pathway (Ma et al. 2017). 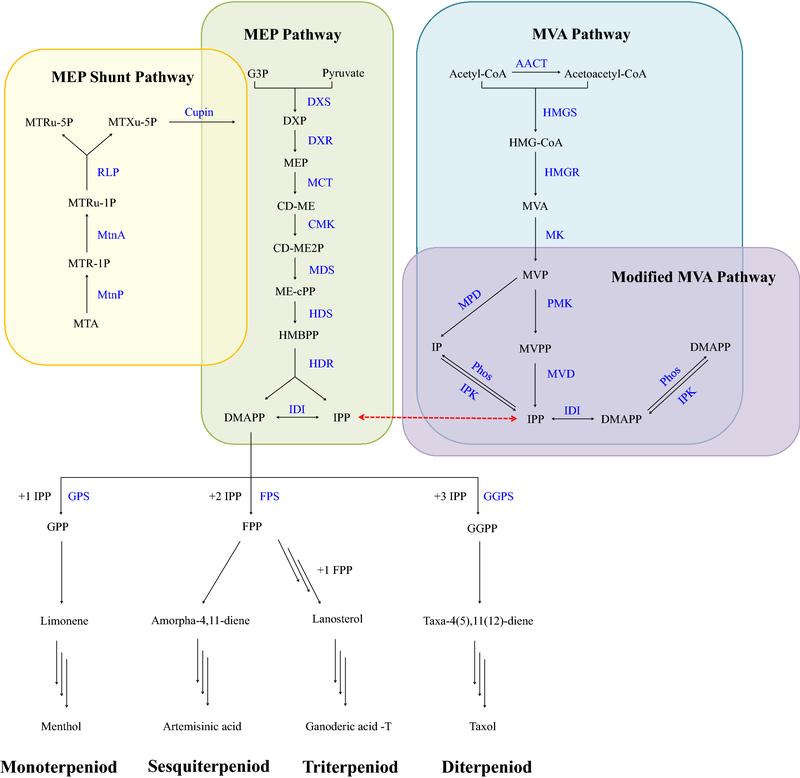 In one specific exception, the plastid-localized MEP pathway was the only active pathway for supporting the biosynthesis of plastidial monoterpenoid and cytosolic sesquiterpenoid in snapdragon flowers (Dudareva et al. 2005). In addition to manipulation of endogenous pathways, exogenous stimuli can also affect the interaction between the MVA and the MEP pathway. One is sugar (Fig. 3b). Sucrose induced the activity of sucrose non-fermenting 1-related protein kinase 1 (SnRK1), which reduced HMGR activity by phosphorylation (Polge and Thomas 2007; Sugden et al. 1999), and accordingly increased substrates for the MEP pathway. As a result, chlorophyll production was increased in intact Arabidopsis seedlings grown in medium supplemented with sucrose (Laby et al. 2000). Another is light (Fig. 3c). Light down-regulates the expression of MVA pathway genes (Enjuto et al. 1994; Learned 1996; Rodríguez-Concepción 2006; Stermer et al. 1994), but up-regulates the expression of MEP pathway genes, including DXS, DXR and HDR (Botella-Pavia et al. 2004; Carretero-Paulet et al. 2002; Cordoba et al. 2009; Hans et al. 2004; Hsieh and Goodman 2005; Rodríguez-Concepción 2006). In addition, photo-triggered metabolism results in the increased production of substrates (e.g., G3P from the Calvin cycle) for the MEP pathway, which helps to increase IPP and DMAPP production in chloroplasts and leads to an increase in MEP-derived terpenoids. As indicated in many investigations, accumulation of IPP, DMAPP, and other intermediates may affect cell growth and terpenoid biosynthesis in various species (Anthony et al. 2009; Martin et al. 2003; Pitera et al. 2007; Sivy et al. 2011). On one hand, overexpression of the downstream enzyme could effectively attenuate their toxicity. To improve sesquiterpene β-farnesene production, genes encoding farnesyl diphosphate synthase (ispA) and β-farnesene synthase (fg) were expressed in E. coli, but the yield of β-farnesene was very low due to the inhibited cell growth caused by IPP accumulation. To solve this problem, overexpression of IDI and IspA successfully reduced the IPP content. The engineered strain produced 800-times higher β-farnesene than that of the control strain (You et al. 2017). Except for direct overexpression of enzymes, modification of key elements [e.g., promoter, ribosome binding site (RBS), etc.] is also crucial for regulating the enzyme activity. In one study, a series of FPP-responsive promoters were constructed to dynamically regulate ADS expression to maintain FPP at a non-toxic level. The terpenoid production of the engineered strain was doubled as compared to the control strain using a traditional inducible promoter to drive the expression of ADS (Dahl et al. 2013). In another study, different strengths of RBS were selected for improving the translation efficiency of MVA pathway enzymes. As a result, using the medium-strength RBS for translation of MK, PMK, MVD, and ADS reduced the accumulation and excessive consumption of FPP in E. coli, and improving the production of amorphadiene by about fivefold (Nowroozi et al. 2014). On the other hand, construction of a shunt pathway is also adopted as an alternative to alleviate the toxicity of IPP and DMAPP. To rescue the impaired cell growth caused by the accumulated IPP in E. coli, overexpression of MPD from S. cerevisiae was accordingly performed to dephosphorylate IPP to IP (Kang et al. 2016). Except for MPD, enzymes belong to the nudix hydrolase superfamily can also dephosphorylate IPP and DMAPP (Dunn et al. 1999; Mildvan et al. 2005). The IPP content was significantly reduced after overexpression of nudB in E. coli (George et al. 2014), and growth inhibition was relieved. Further, George et al. optimized the Shine-Dalgarno sequence of nudB to construct a more efficient NUDB to reduce IPP (George et al. 2015). In a recent study, the effects of IPP accumulation in E. coli were comprehensively assessed, which provided more novel targets for alleviating IPP toxicity (George et al. 2018). Relying on the reduced cell growth caused by IPP toxicity, attractive methods were developed to discover or engineer downstream enzymes for terpenoid biosynthesis. These toxicity-based screening methods are wide applicable regardless of host cells. In one example, the Bacillus genomic DNA library was introduced into an engineered E. coli strain capable of producing excessive levels of IPP and DMAPP, to screen mutants with restored cell growth and discover potential downstream enzymes for hemiterpenoid production. As a result, two genes (yhfR and nudF) were discovered as prenyl phosphatases, which could catalyze IPP and DMAPP to form isopentenol (Withers et al. 2007). In another example, similar method was adopted for directed evolution of isoprene synthase (ISPS) with enhanced catalytic activity on DMAPP. Combined with protein engineering and metabolic engineering strategies, the engineered S. cerevisiae strain was able to produce 3.7 g/L isoprene (Wang et al. 2017). Providing a suitable supply of IPP and DMAPP is crucial for efficient terpenoid biosynthesis. Most efforts in manipulating IPP and DMAPP supply focused on rewiring the central metabolic pathway, overcoming the rate-limiting step, introducing heterologous pathway, enhancing the interaction between different pathways, toxicity attenuation and utilization of the toxicity to discover or engineer downstream enzymes, which greatly improved bioproduction of corresponding terpenoids. For all organisms that contain a native pathway to produce terpenoid, strategies including rewiring central metabolic pathway, overcoming the rate-limiting step and toxicity attenuation have excellent potential to generalize. To overcome the natural regulation from the host, introducing heterologous pathway is the method of choice, while enhancing the interaction may harness the advantages of different pathways to support terpenoid biosynthesis. The impaired cell growth caused by the toxicity of IPP and DMAPP allows establishment of a cell growth-based high-throughput screening method to optimize the downstream pathway for higher terpenoid bioproduction. Since addition of exogenous stimuli could regulate the biosynthetic pathways of IPP and DMAPP, and significantly change the terpenoids production profile, it could be more meaningful to construct a combination pathway to produce different terpenoids by exploration of the exogenous stimuli for industrial production. In the future, with the aid of multi-level omics studies (Alcalde and Fraser 2018; Martinez-Esteso et al. 2015; Vickery et al. 2016) and various genome editing tools (e.g., CRISPR-Cas9), multiple metabolic engineering endeavors can be performed in parallel to test potential combinatorial effects of above-mentioned strategies in a highly efficient manner. In addition to targeting pathway genes, fine-tuning host regulation also plays vital role for supplying IPP and DMAPP (Fitzpatrick et al. 2011; Hemmerlin et al. 2004, 2012; Leivar et al. 2011), which could be considered as a promising alternative for further improving terpenoid biosynthesis. HX conceived the study. QW collected references and prepared the draft with assistance from SQ. HX finalized the manuscript. All authors read and approved the final manuscript. H.X. gratefully acknowledges all the financial support. This work was supported by the National Natural Science Foundation of China (No. 31600071), Municipal Natural Science Foundation of Shanghai (Nos. 17ZR1448900, 18ZR1420300), and Open Funding Project of the State Key Laboratory of Bioreactor Engineering.